As you might have guessed from my earlier post on how to make Fish Fingers and Custard, The Ladies are quite fond of reproducing foods from books, movies, tv, and all that. We also like it when other people do it for us. Since our moms were so good at teaching us how to share, we are going to continue to post our successes (and failures, because that can be fun too) for you to either try on your own or avoid for the sake of your sanity. 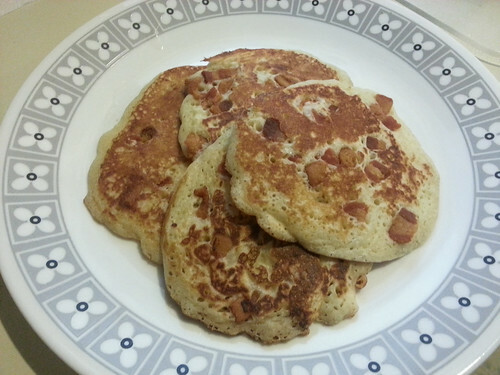 What is so nice about this recipe re-creation is that Jake is kind enough to share his recipe in the song itself: make some bacon and you put it in a pancake. However, for those of us who are a bit more into details, I've created this quick recipe and tutorial. Start by cooking your bacon. 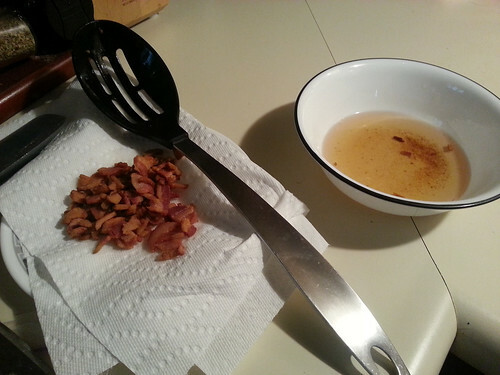 While there are many ways to cook bacon (microwave, oven, frying pan), I chose to cut my bacon into small pieces before frying it in a pan. This allowed me to reserve the bacon fat to use later to cook the pancakes in instead of butter. This infuses some extra bacon flavor into the finished product. Resist the temptation to snack on all the little bacon pieces and sift together all the dry ingredients (flour, baking powder, salt, white sugar) into a large bowl. 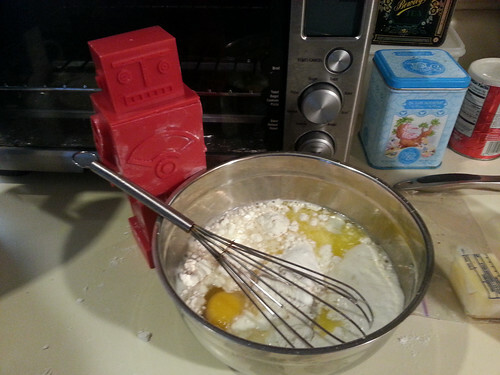 Add the wet ingredients (milk, egg, melted butter) and whisk together gently. Heat your frying pan to medium high and brush the pan with some of the bacon fat (or you can use butter if you'd prefer). 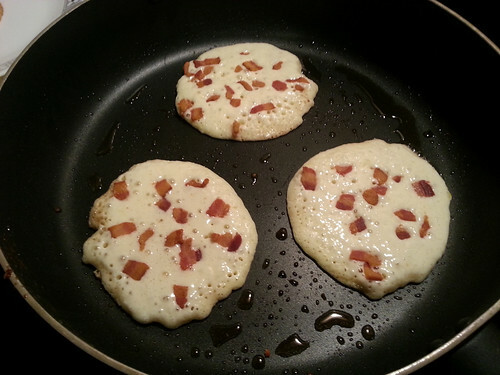 Pour about 1/4 cup of batter into the pan per pancake and sprinkle with the cooked bacon. By adding the bacon at this point and not just stirring it into the batter earlier, your bacon stays crispy and more visible. When the tops of the pancakes begin to bubble on the sides, flip them over and cook for a few moments more. The finished pancake should be golden brown, light and fluffy. I really think that Jake the dog was on to something here. 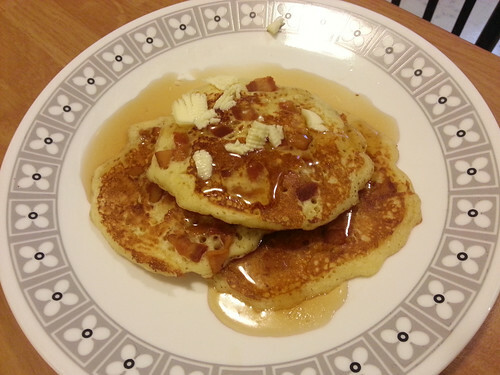 The salty crunchy bacon not only adds a change in texture, but enhances whatever sweet syrup you might use on your pancakes. I chose to smother mine in some maple syrup and some extra butter. I have no regrets. None at all. Well except for one thing. That song is still stuck on my head.